The Pulling Linemen: Ndamukong Suh – Dirty or Dominant? 2nd overall pick in 2010. Defensive rookie of the year. 1st team All-Pro. 66 tackles, 10 sacks, 1 forced fumble and an interception. And now a dirty player. Or is he? The majority of American sports media are in the process of crucifying Ndamukong Suh for what they call dirty play. Last season Suh got fined twice, once for a hit that was typical of his play with Nebraska on Jake Delhomme in the preseason and the second was by all accounts a terrible call for a “forearm blow to the head” of Jay Cutler, watch the clip and tell me if that’s illegal and worthy of a fine. This pre-season Suh has already been (fairly) fined for a hit on rookie QB Andy Dalton and was at the centre of the media’s coverage of a fracas that was initiated by Logan Mankins on Saturday night, who should have been the one getting accused of “dirtiness”. Suh jumped to the defense of a team mate when Mankins continued with a bout of less than friendly face-mask yanking after the whistle had blown. Suh aimed a punch at Mankins’ face mask in retaliation. Ill-conceived yes, but far from dirty. We here at The Pulling Linemen have a different view however. 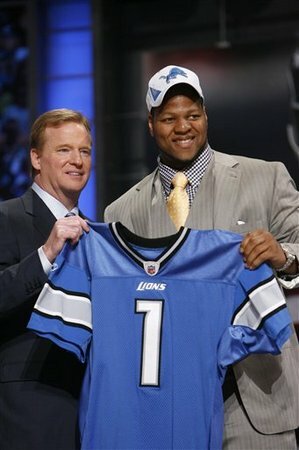 We love Ndamukong Suh. When #90 lines up on the field of play you stop watching the ball and watch the line of scrimmage (something we encourage our readers to do more often) because you know something is going to happen. On Saturday night I sat in awe as Suh and his line-mates laid waste to what we consider as one of the best offensive lines in the league. They harried and hurried Tom Brady to such an extent that ESPN’s Ross Tucker tweeted that the Patriots should take their MVP quarterback out of the game before he got hurt. 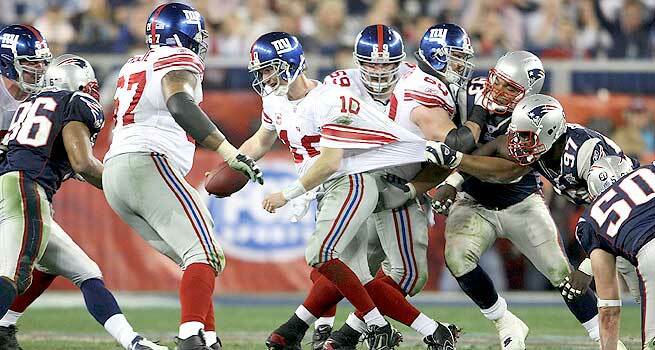 As much as I hate seeing Brady get hit repeatedly I love the style with which Suh goes about his work. As Bill Parcells famously put it "This is not a game for the most well-adjusted people.". Now I’m not saying Suh isn’t well adjusted, by all accounts he seems like a perfectly nice person off the field, but when he pulls on his helmet and steps onto the gridiron he becomes a monster. "Last year, we earned respect, but this year we want fear," Suh told a CBS Sports reporter on saturday. "We want quarterbacks to fear us, and we want offensive lines to fear us." This is exactly the attitude that every player of any sport should have. If you’re not doing everything in your (legal) power to strike fear into your opponent then you’re not doing everything you can to win. By all means be friendly off the field but once you take to the arena of combat that attitude should be replaced by one of competitive drive and desire to dominate. And that’s what Suh does best. If you missed his 2009 campaign with Nebraska I suggest you go find some tape of it, especially his performance against the Texas Longhorns in the 2009 Big 12 Championship Game. Suh collected 4.5 sacks against now Cleveland QB Colt McCoy and won game MVP despite Nebraska being on the losing side of a nail-biting 13-12 result. The style of play Suh is being criticised for now is one that got him such great results, awards and praise in college along with his high draft selection. But seemingly there is a different standard in the NFL. In the pass-happy, protect the QB mode that the NFL is now in Suh’s style is seemingly unwanted by the powers that be and those who pander to them. But how he plays the game is how everyone should play it. Too often these days defenders fail to make the tackle because they look to make the “highlight reel” hit with the shoulder and end up missing or just bouncing off powerful players. Suh doesn’t do that. He wraps up and drives the player down to ground. There are plenty of examples where quarterbacks have escaped near-sacks before finding a receiver down field for a big play, you don’t see that very often when Suh’s charging in on the QB. And just how exactly are you supposed to bring down some of the beasts that now play the quarterback position if you’re not playing aggressively? Ben Roethlisberger, Josh Freeman and Cam Newton are all over 6 foot 5 inches tall and 240lbs. That’s bigger than some line-backers! And all 3 of those aforementioned QBs can run too. Throw in running backs like Brandon Jacobs and LeGarrette Blount who are of similar size or the speedsters of Jamaal Charles and Chris Johnson and just how are you mean to make the tackle without going all out like Suh does? I’ve spent this summer playing defensive tackle, offensive tackle and occasionally offensive guard for the Oxford Saints here in the UK and I can tell you the only way to play DT is at full-speed and as hard as you can, you’re taught to play to the whistle and not just hit the ball carrier but hit THROUGH them and ensure they don’t get away. Suh does this better than most of the defensive tackles out there. He punishes those who he hits. Does he go over the top occasionally? Yes. Controlling yourself in the tackle is important, but the aggression and fire with which he plays ought to be held up as an example to those learning the position, not used as a case in point of what you shouldn’t do. If I don’t go as hard as I can on the field I let my team mates and myself down. If Suh doesn’t then he’s also letting down 60,000+ paying attendees and millions of fans around the world. He’s not willing to do that, and should be applauded for it, not chastised. Suh clears a path for himself. It could lead to Canton. Ndamukong Suh is a relentless, tough, vicious football player. He hits hard and for the large majority of the time it's clean. The drive he shows on the field is re-energizing Detroit and changing expectations for a city where the Lions had long been the joke of the sports teams. I hope he keeps playing like this for many years to come. Unless he happens to play against the Patriots again. Then I won’t be too upset if he decides to take a game off. I doubt he will though.